Happy Friday!! Are you all feeling SEPTEMBERY?? I love September! And October! I don't really love November! I do love December! I'd like to like January because it sounds pretty and my birthday is in it. But January in the Pacific Northwest is a big pile of poop. (My daughter is going to yell at me for using potty talk.) I'm happy for this weekend because we don't have a lot planned, and I just got my new October Martha Stewart magazine, and my pal Shannon told me that 'Gilmore Girls' is coming to Netflix!!!! I am SO ready to watch that whole show again from the beginning. You gotta check out Monkeybar Buddies -- play shorts for wearing underneath little girl dresses! Ok 'The Riot Club' just jumped to the top of my Must See list. Secret societies and hot preppy English dudes? This is better than my East Coast prep school obsession! OH HOW I LOVE a nice ticking stripe pattern! My default mode of bedding is always ticking stripe. I have flannel ticking stripe for winter and cotton ticking stripe on my bed right now. My friend Darcy is such an AMAZING photographer and she just launched her photo website. You have to go see! I'm so in love with her work. Brilliant book list: 12+ books for kids not ready for Harry Potter. Cool Book of the Week: Another newly published book of 'lost' Dr. Seuss stories!! 'Horton and the Kwuggerbug and More Lost Stories'. I'm getting this immediately for my toddler nephew!!!! The Grinch is in it! Horton the elephant! I just realized I have totally overused exclamation points in this post. You can read more about it here. Thank you so so much for the shout out! It made my day! I am typing from the comfort of my ticking stripe-sheeted bed! (Target Threshold) It feels like fall today, in the 60s and cloudy and drizzly. Can't go out and play, but Mr. B has the window up with a fan for me. By the time I'm up and at 'em again, it's supposed to be back around 80 degrees. Silly nurse didn't understand why I'd be disappointed about this. Loving all the fall booklists and apple crisp recipes going around. I prefer apple crisp to apple pie or cobbler. The oats make it perfect. So excited for the new Seuss stuff! Love the crappy friends bit. Funny, my girls are already better at weeding out the bad than I ever was. I always want to make everyone happy. Have a beautiful weekend! NICE!!!!! I like apple crisp best too - mostly b/c I just cannot master apple pie. Not sure why. I can never get the juice thickness just the way I like it!!! Enjoy your bed and here's to good recovery for you! "Fall" in LA = THE HOTTEST WEEKS EVAR! Blergh. Give me Pacific NW January any day. Thank you for the link to the MonkeyBar Buddies. I have been looking for some cute under dresses shorts for Harper. Totally makes sense! I'll be buying some soon. Also want to make the kid snacks. The vanilla wafer ones will be fun for Harper to make too. Sprinkles! Oh and I guess I'll have to eat a few pizza crescents...oh well. I think those snacks were really meant for me! And yeah aren't those shorts looking super genius? Julia is all about the under-dress shorts! BTW -- made the nilla wafer/peanut butter/banana/sprinkles thing. Very tasty and cute when you make them (though not nearly as perfect looking as the picture). But dang, one bite and they slide all over so you don't really get the sandwich part. I guess if you worked hard on holding it super tight...Yummy though! Next up -- pizza crescents!! thanks again. September is still hot here but we may see some cooler weather by mid-October. That homework desk is lovely. I tried to keep my son's desk organized for him but I have to clean it daily or it will be covered with toys all over again. Sigh. I have such a messy boy! 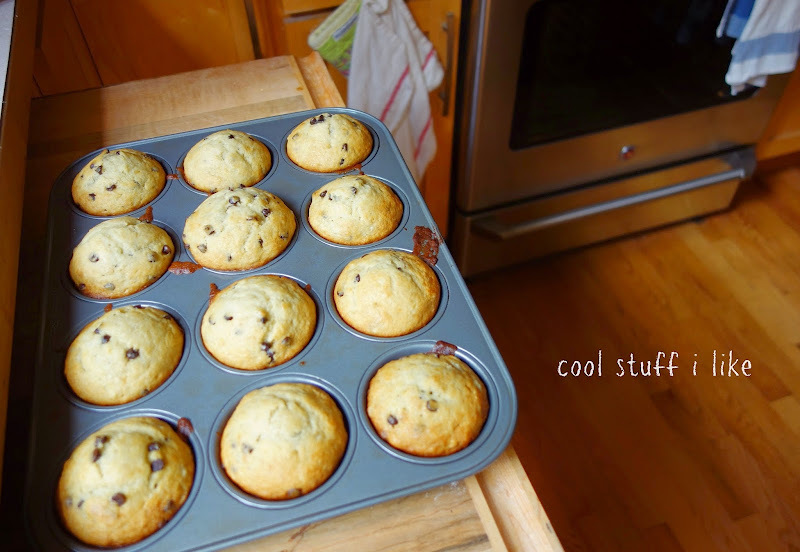 Love those muffins in your picture. They look so incredibly yummy. But my crown just fell off this morning and now I am in pain until I can see the dentist again (his office is closed today... of course). those were banana choc chip muffins ~ the recipe is on the blog! gah, feel better with the crown situation!! Yes, Oh Yes, I am feeling very Septembery! I just wish the weather felt more like mid September than July! I so love Gilmore Girls and managed to watch an episode this morning. That is one show I always have and always will love! We are headed to Whole Foods for weekly grocery shopping along with pizza and gelato tomorrow! If they have pumpkins, I am so bringing one home with me :) Happy Weekend, Melissa! Pizza and gelato? Your weekend already sounds awesome!!!! i love that you've already watched an episode! OMG OMG OMG I hope it comes to Netflix instant. I've been wanting to try the show for yearsssss. it's one of the bestest shows EVER. ever ever ever. You will LOVE it!!! Love Horton, and you bakes are making me jealous, detoxing is no fun! I really should far less sugar and grain than I do! Let me know if you just feel magical after your detoxing plan -- if so I might have to really try and rein my consumption of those items in! i didn't eat much sugar while pregnant b/c I had pregnancy diabetes and after while of that, everything tasted far too sweet to me -- it's amazing how we can acclimate! Cranberry Thanksgiving!!!! LOVE that book! And Pumpkin Moonshine......so much love I can't even tell you......! I'm loving the ceiling of the homework station room! Love! what's on the ceiling?? I don't even recall. I gotta go look again! OH YEAH! that amazing wallpaper! it's amazing!